Volunteers are being thanked for their part in a successful weekend beach clean on Selsey beach. The clean-up took place on Saturday 15 September and was organised by Chichester District Council as part of the Marine Conservation Society's 25th annual Great British Beach Clean. The event was also organised as part of the Selsey Bathing Water Enhancement Project, a partnership project with Southern Water and Chichester District Council. The most unusual item found was a six foot metal pole and metal from what is believed to be from the bottom of a lobster pot. Information about all the items found was recorded as part of a detailed survey which will then be submitted to the Marine Conservation Society. This will help highlight where the rubbish has originated from, with the aim of carrying out further targeted awareness raising and education in future. The Mulberry Divers group also volunteered to clean the sea bed, and luckily not much was found this time. The council's Community Wardens, Neil Hill and Drew Allardice helped set up and take down the event and also patrolled the beach. 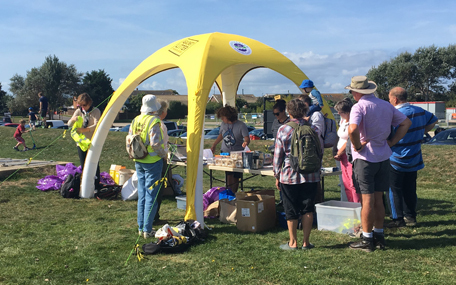 After the two-hour beach clean, the Selsey and District Lions put on barbecue for all the volunteers, with meat kindly supplied by Selsey butchers Ian Francis and Sons). Councillor John Connor, Cabinet Member for Environment at Chichester District Council, said: "This was a wonderful community event and we are very grateful to everyone who came out and gave their time to help make a difference. "Luckily the weather was very sunny and we had some really excellent feedback on the event. I know that after all the hard work, people really appreciated the barbecue put on by the Lions. "Keeping our environment - including our beaches - clean is so important and I would urge people to find out more about how they can help by signing up to our Against Litter campaign.